Now that I’ve had some practice soldering, and de-soldering, in my previous post, I was less apprehensive tackling this part of the project. 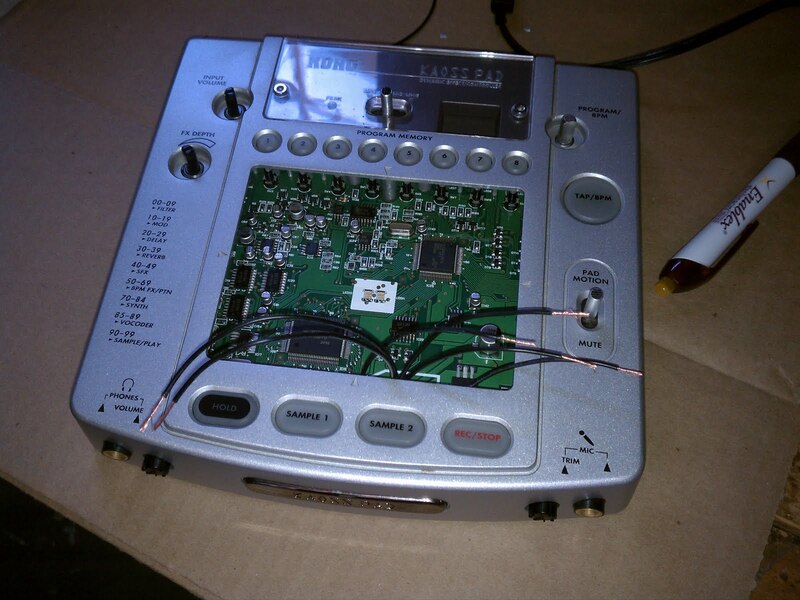 As an aside, and if I knew when I was starting, my life would have been made a lot easier if I knew about the KAOSS Pad interface kits that are sold on places like Amazon.com (click here). This kit allows you to install a touch sensor in your guitar, without ripping apart the KAOSS Pad. Click here for more information. In this step, I will solder wires to the KAOSS Pad PCB (main circuit board). The purpose of this step is to allow connection points to be established from the circuity, to the connectors that allow us to run a control wire to the unit in the guitar. I will cover this in much more detail, in a later post, but I will let you in on my plan that I will be using CAT5 cable and connectors to establish this connection. Previous iterations of this type of project, found on the Internet, use a 9 pin connector (think desktop computer monitor cable and connectors), which I find to by clunky and cosmetically lacking. Having absolutely no desire to program a complex MIDI interface, CAT5 appeared to be the way to go. If you are unsure about what a CAT5 cable is, think over sized telephone cable, or computer network wire. It took me a few tries before I found the correct gauge wire that would fit in the small holes in the Korg circuit board. Ultimately, I ended up with 18 gauge Radio Shack wire. This wire is not solid, but comprised of wrapped strands. In this first step, I cut five lengths of wire, each the same size. Four will be mounted to the KAOSS Pad circuit board, and one will be used as a length template, in case I make a mistake and need to cut new wires. Before you start soldering, strip both ends of four of the wires. Trust me, it is much easier to do this now, than when they are attached to the KAOSS Pad PCB. Thread one end of each of the four wires through the holes that remain from the desoldering exercise in the previous post. Make sure you feed the wires through the top side of the PCB. 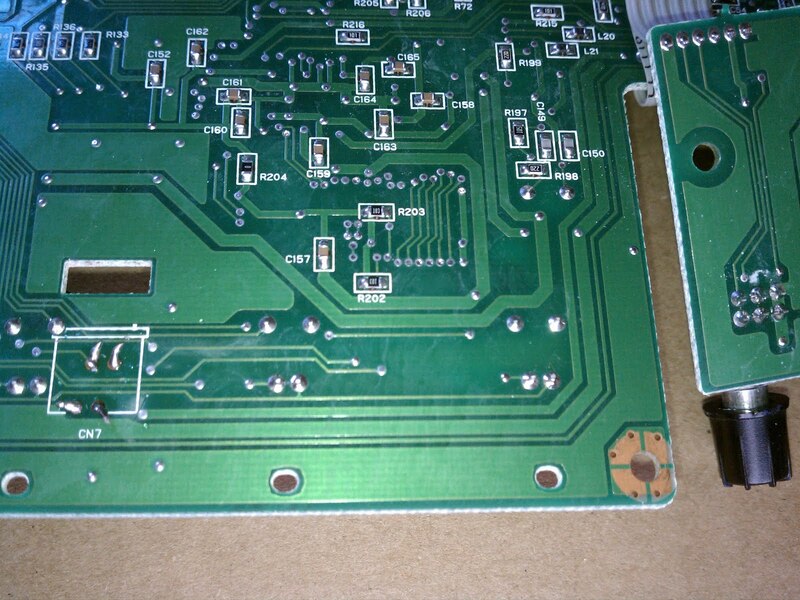 Note: If you have difficulty fitting the wire through the small holes on the Korg PCB, you can adjust the size of the wire by removing a few of the “wrapped” wire strands. After threading each of the wires, bend the end against the PCB to hold it in place (image below). This will help, as you must turn it upside down to solder the connections. The next step is to solder each of the wires in place. It is important to note that you must be relatively clean in your soldering, as you don’t want to bridge any connections between any of the wires. As a side note, bridging a connection refers to creating an electrical connection between two points, either from runny solder joints, or bare wires contacting one another. The picture below shows four, relatively clean, solder joints with no bridged connections. Once you have four, clean, solder joints, you may clip the excess wire with a good pair of wire cutters (image below). This helps to clean the whole thing up. Now turn the board over, and you should have a neat looking group of wires protruding from the KAOSS Pad PCB (image below). In the next step, I had to identify the connection points for the “Hold” button, so that I can run lead wires from them. The “hold” button on the KAOSS Pad allows you to store a touch setting in real time, rather than allow the X/Y values return to 0/0 when you remove your finger from the pad. This isn’t necessary, but is a nice to have. Take a look at the top of the PCB. You will see a bank of four, red, LED lights and circuit mounted push buttons. The leftmost button, marked LED12 (picture below) is the hold button assembly. 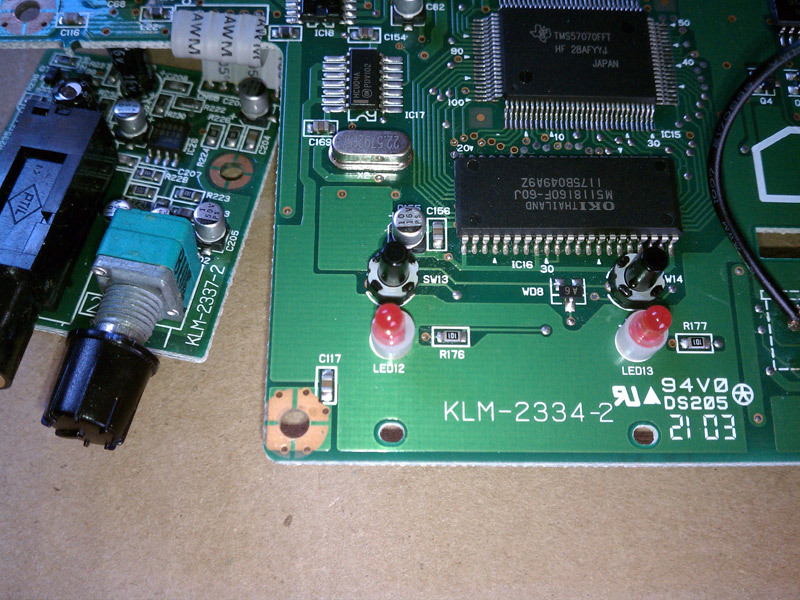 Now put your finger underneath the PCB, and find the two sharp solder points for this button. Flip the PCB over, and take note which two points you identified. Cut two more lengths of wire, about twice as long as the last, and solder one to each of the hold button connection points (picture below). Once the solder joints solidify, feed the two wires through the hole in the circuit board and group them with the other four wires. Once all the wires are attached, you can then flip over the circuit board and you should see something like the picture below. Success! Before you go any further, now is a good time to double check your work. Verify that no connections are bridged and that all solder joints are firm and secure. At this point, you should make a note of which wires are which. Feel free to use whatever shorthand you find useful, but ultimately you need to keep track of which wires correspond with each point on the board. 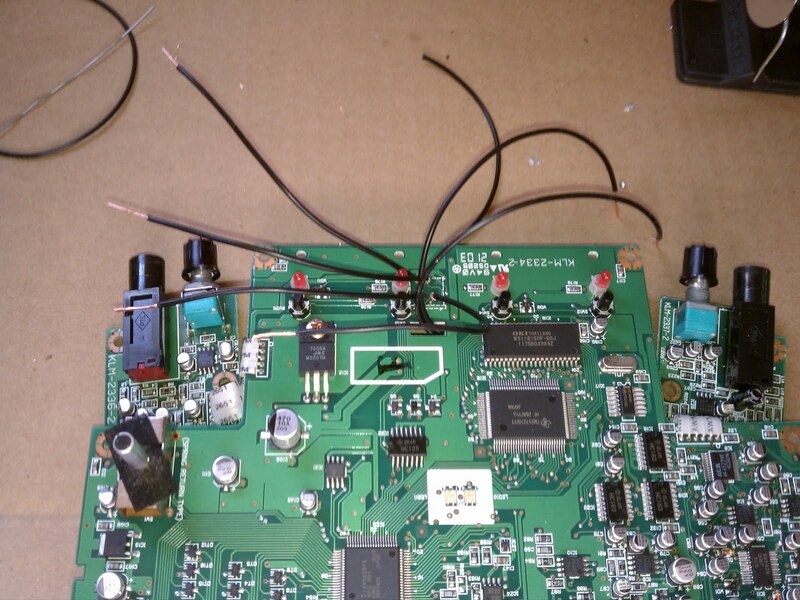 You must then match them up with the connection points on the white ribbon connector (the one desoldered in the previous step), as well as the wire lead extending from the touch screen assembly. Below is an example of my super scientific notation on expensive cardboard remnant! 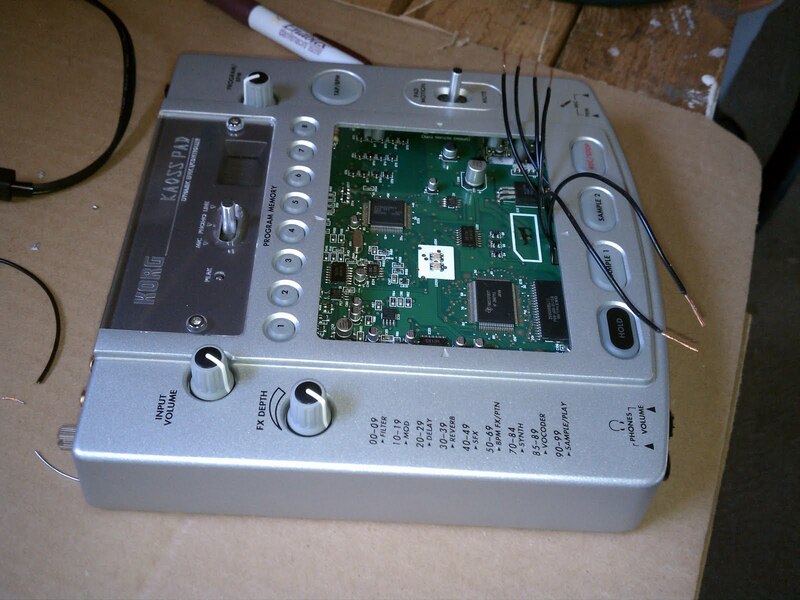 Once you have a handle on which wires are which, you are ready to put the whole thing back together! At some point, I have the feeling that I’m going to have to take the KAOSS Pad apart again, but I’ll cross that bridge when the time comes. Act as a dust cover to protect the electronics. Serve as a mount point for the CAT5 jack. That’s it for now! At this point, I’m waiting on some parts to arrive. That will probably be the next post, and the guitar modification may continue. See you soon! Remember, you can now purchase an easy to install KAOSS Pad interface, so you can enjoy all of the touch sensor goodness, without ripping apart your KAOSS Pad. Click here to check this out on Amazon.com. I wish I knew of this in the beginning! i need this so much,,did you have a diargam wiring nya?? Sorry – I didn&#39;t see this comment sooner. Unfortunately, I don&#39;t have a wiring diagram, but tried to be as detailed as possible with the pictures. I am just completing the lacquer finish, and will be posting pictures of the final assembly (with electronics connections) within the next few weeks.